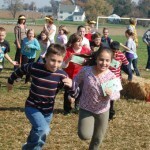 All seven elementary schools in the Penn Manor School District hold a “Race for Education” fundraiser. Four of the schools hold it in the fall; three in the spring. 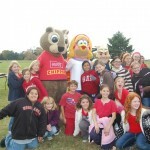 The goal of each event is to raise money for the school PTO to sponsor field trips, assemblies and other student programs. 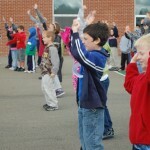 The students obtain pledges to run, walk or jog for one hour. Each elementary school puts their own spin on things. 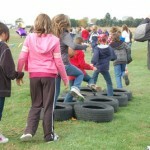 Martic Elementary kicked off their Race for Education on Friday, October 21 with an outdoor warm-up to popular music followed by a fall themed running track and a bubble machine to the delight of the students. 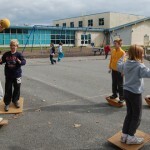 In addition to the run, walk, jog course, Eshleman students participated in a yoga session and an obstacle course manned by Millersville University students for their “Exercise for Education.” On Friday, October 28, Pequea Elementary generated excitement for their “Pacing for Pequea” with a DJ, dancing, a boot camp area, and help from local mascots – CometMan, Hilda the Turkey Hill Cow and Chipper from Herr’s Snack Foods. 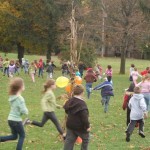 Wrapping up the fall fundraisers was “Central Manor Miles” on Wednesday, November 2. 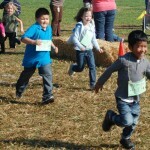 A warm-up to popular music was followed by a run through bales of hay on a bright, sunny day!